While writing a review about Pooz Cyclone stumbled about the save game. In the final version of Pooz it uses a simple encryption which was surely made up in a hurry or perhaps Cooper was just bored with it. Anyway it was just a matter of minutes to break the encryption manually and to figure out how the lab was encoded into the save game. 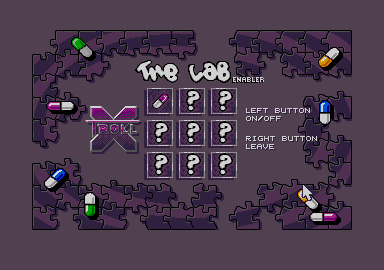 Changing scores would also have been possible but since this is a stupid cheat he didn't include it, however it surely makes sense to enable the cards in the lab, especially since there are two bonus games included in the lab. And one of them is really addictive. Yes we know there is a cheat code to achieve the same result, but we are not supposed to tell you about it, so writing this small tool was the only way that seemed legal to us. This program is no Trainer but it allows to load a Pooz save game and to modify it. PoozEd should be copied into the game directory and automatically loads and saves a present save game. If you have no save game in the current folder it just exits to TOS. The rest is pretty self-explanatory: Use your mouse to point onto a card and left click to toggle it's status. When you are satisfied with the result you might want to use a right click to exit the program and save the modifications.